Today saw the first significant snowfall in Denver, Colorado for the 2017-2018 season. Most of the snow didn’t stick to the pavement though due to the 70-degree heat over the last couple of days. We’re sure many of you are wondering: When will it begin to snow in my state? 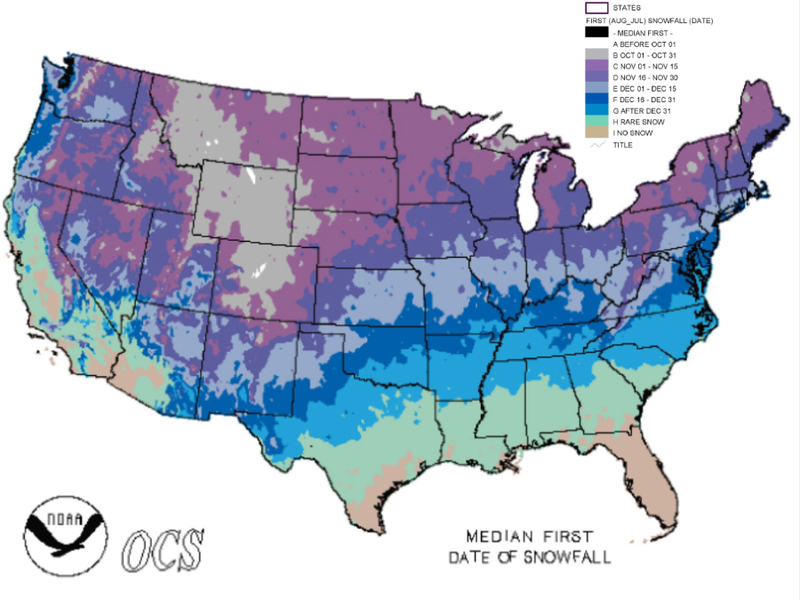 This nifty chart does a good job of showing when the first snowfall of the season usually happens throughout the USA. It’s important to recognize that the first snowfalls in each state obviously differ based on the elevations within the state. The whitest/grayest areas, indicating the earliest snowfalls, are along the Rocky Mountains and the Appalachian Mountains as one would expect. The good news is that the Shovler App continues to add shovelers in areas throughout Colorado such as Aurora, Englewood, Wheat Ridge, Denver, Fort Collins, and the list goes on. Remember to share your individualized promo codes within the app in order to earn credits to be used in the app and find more snow shoveling jobs. We are looking forward to the next big storm! Announcing the Newest Release of the Shovler App! We are happy to announce that we just uploaded the newest version of the Shovler App for the 2017-2018 winter season! Last season, we received lots of feedback from users, and tried to incorporate as much as possible into this version. We fixed bugs, increased security, updated the terms of service, revamped the payments, and added lots of new features including GPS tracking of shovelers, and chat integration. If you have the old version of the app, please make sure to download the updated version from the App Store and Play Store, as the old version will no longer work. In order to learn more about the new version of Shovler, and see more screenshots, please see our latest Medium post. We chose to upload it today so that we would be ready for the snowfall today in Montana! We have snow shovelers registered throughout Montana including Great Falls, Billings, Missoula, Bozeman, and Helena. Author ShovlerappPosted on October 2, 2017 Categories NewsLeave a comment on Announcing the Newest Release of the Shovler App!